As the official name of Paris–Bordeaux–Paris Trail suggests, the idea of this particular event was to see who could drive from Paris to Bordeaux and back again in the quickest possible time. For reference, this was a distance of 1,178 km or 732 miles on the roads of the day. So what was so special about this particular race? Well, for the first time in history, a large group of automobiles would be pitted against one another in a first to finish-style event, with said race kicking off on June 11, 1895. The brainchild of a group of automobile enthusiasts and journalists keen to promote the then fledgling French automobile industry, the race was seen as a way to both test the limits of cars at the time as well as test the commercial viability of motor racing as a spectator sport. Although, as we’ve previously noted, this was only a couple decades after an era in which competitive walking was one of the world’s most popular spectator sports, so the competition was pretty light. And, to be perfectly clear- we’re not talking speed walking- just regular leisurely walking for hours and hours on end… In fact, certain walking matches were known to draw tens of thousands of spectators. Yes, before YouTube, our forebears found watching people casually walking in circles for sometimes days on end without stopping great entertainment, though to be fair this was probably really just an ideal excuse to get together and socialize. To tie it back to cars, in some respects this is not too dissimilar from NASCAR, but without the occasional flaming crashes. In any event, previous to the Paris–Bordeaux–Paris Trail others had variously raced individual cars against one another, with perhaps the first such race occurring on August 30, 1867 where a steam powered car built by Isaac Watt Boulton, driven by his son, competed in an eight mile race against one of Daniel Adamson’s steam cars, with the driver in the latter case not known today. Moving closer to what we’d today consider an automobile race was an event that took place in Paris in 1894- the Paris-Rouen Rally. However, while this is sometimes called the actual first car race, it should be noted that, beyond the organizers of the event explicitly noting it was not a race in a December of 1893 edition of the Le Petit Journal describing the event, the winner was not the car that crossed the finish line first. Rather, the winner was decided by a panel of judges based on the overarching criteria of which car was closest to “ideal”, with ideal here referring to the car that was simultaneously relatively cheap to purchase and operate, most reliable, and easiest and safest to drive. Towards that end, while the order of finishing the course was considered in determining the winner, the car that crossed the finish line first was not given 1st place as it needed a second person to ride along to stoke the flames to keep it going. Instead, the first prize of 5,000 francs (extremely roughly between about $30,000 to $400,000 today depending on what inflation metric you want to use) was shared between two companies, most notable for the story at hand, one of which being Panhard et Levassor. This brings us to about a year later and the Paris-Bordeaux-Paris Trail competition. In this event, the winning car was intended to be the one that completed the circuit first, with a few stipulations. First, any winning car was required to have more than two seats. Second, while mid-race repairs and maintenance were allowed, they could only be performed with materials stored in the vehicle itself. On top of this, drivers were allowed to switch out as often as they liked. Finally, largely to stop manufacturers flooding the race with their own vehicles to pad the odds in their own favor, it was ruled that manufactures could only enter one of each type of vehicle they produced. In total, some 23 automobiles entered the race, only 9 of which would finish the arduous journey between the cities, with eight of those being ICE vehicles (internal combustion engine) and the ninth being a seven seater steam car. On top of gas and steam powered automobiles, there was even an all electric car entered- yes, contrary to popular perception, electric cars actually dominated the automobile world in the earliest days of the industry. The popularity of electric vehicles at the time is easy to understand. 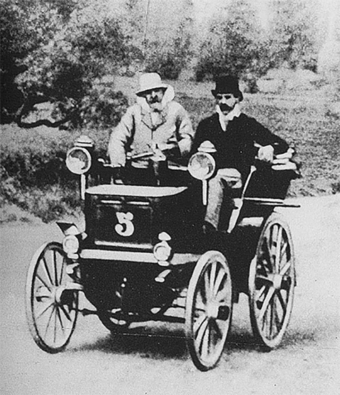 The electric cars had no excessive vibrations from the engine and were extremely quiet compared to its competitors. They also didn’t emit smoke or backfire frequently as did gas powered cars. They were also ready to go right when you sat in the car, unlike gas powered cars that needed to be cranked by hand to start; this was not only difficult, but also could be dangerous. Steam powered cars, on the other hand, typically required a half an hour to an hour to get going on cold days. In any event, as a result of the diversity of power sources in the Paris-Bordeaux-Paris race and the extreme length of the course, it was also seen as a way of judging which method of powering automobiles might be superior. Soon after the race began, it became clear to pretty much everyone involved that the winner was going to be Émile Levassor’s Panhard et Levassor car powered by a modified four horsepower Daimler Phoenix engine. The car was unique in several ways. To begin with, it broke from tradition by having the engine in front of the driver. In experimenting with various positions, Levassor found this to be superior via lengthening the wheel base significantly, while also lowering the center of gravity by having the passenger not above the engine as was common, but closer to the ground behind it. In both cases, this made the car much less likely to roll over, which was a bit of a problem with many early cars, particularly driving on less than perfect roads. His design also sported a unique (for the time) clutch system allowing Levassor to adjust the vehicle’s gears easier on the fly. It also featured a front mounted water radiator, massively improving the reliability of the engine compared to most others that simply relied on natural air cooling. On top of this, he got rid of the bicycle style belt drive and went with a crankshaft and connecting hardware to the rear differential. This novel layout and general design (front engine/rear wheel drive), which would soon be copied by pretty much every car manufacturer would, ironically, come to be known as the Systeme Panhard, presumably because Panhard’s name came first in the pair’s company name, even though Levassor, not his business partner Rene Panhard, is generally credited as being the one who actually came up with most of the innovations. In any event, this general design made Levassor’s car not only extremely reliable, even over continuous use for hours at a time, but also much more agile, giving Levassor a clear edge over his opponents. Within an hour, Levassor was easily leading the race and arrived in Bordeux so far ahead of his opponents that his co-driver, who was supposed to drive the second half of the race, was still asleep in his hostel. In fact, because he had arrived so much sooner than anyone expected, the officials he needed to notify about his arrival were also sleeping. After being unable to discern which hotel his co-driver was staying in, Levassor decided to just wake up the race officials so they could verify he’d been there, then drove back to Paris on his own, setting off at around 2:30AM after having a short walk and a glass of champagne and a sandwich. After driving for 48 hours and 47 minutes without sleeping, Levassor arrived in Paris, including stopping time averaging a breakneck pace of about 15 mph (24.1 km/h). He noted upon his arrival, “Some 50 km before Paris I had a rather luxurious snack in a restaurant which helped me. But I feel a little tired.” As such, after officials acknowledge his finish, he went off to bed. About six hours later, Levassor was awoken by an official who told him that the person in second place, Louis Rigoulot, had finally arrived. Five hours after this, both men greeted the man who finished third- Paul Koechlin. Unfortunately for Levassor and Rigoulot, when scrutinizing the exact wording of the rules, officials realized that the “two seat” stipulation was not inclusive as in “two or more seats” but required that the car have more than two seats. Because of this, Levassor and Rigoulot were summarily disqualified as their vehicles only had two seats- something that perhaps should have been looked at closer before the racers set out. Unsurprisingly, this caused a great deal of confusion and outrage amongst both automobile enthusiasts and the many thousands who’d gathered to watch the race and clearly saw Levassor win by a massive margin. As such, the race had the intended effect for his and Panhard’s company, with Levassor generally considered the winner by the teeming masses, even though Koechlin, in his four seater car, walked away with the prize. In 1897 Levassor would compete in the Paris-Marseille-Paris race. Unfortunately for him he not only didn’t win this race, but he seemingly died because of it. You see, while traveling at high speed down a hill, a dog ran out in front of his car. Not wanting to run over the animal, Levassor swerved, resulting in the vehicle flipping over. He initially survived the event and even attempted to finish the race, but had to stop, not because his car failed him, but his body. Unfortunately a broken rib and internal injuries saw the 54 year old’s health rapidly decline over the following months. He died of a coronary embolism while sitting at his desk trying to design a magnetic clutch in April of 1897. Since I didn’t see a YouTube video regarding “This Day in History” I came here to read the article. I enjoyed a surprising number of the facts mentioned (anything car related is usually way over my head). I can’t believe the raw deal about the seats if I’m being honest. I also want to thank you for always citing your sources. I truly appreciate it since I’m one of the few people that like to delve into the rabbit holes of more information. I read a book a few years ago about the first around the world race – this era of history is fascinating. How they managed to accomplish what they did without modern technology (even down to heaters in the cars or paved roads ) was amazing. As a side note – those walking “races” sound pretty intriguing. Think about walking for a couple hours, much less several – and now make it a day or two solid? How far could they walk before stopping? People can run marathons, but if they were walking at a measured pace, could they make it 100 miles or more?